Image caption This table is a guide to numbers you may hear quoted. The figure in the second line, for example, is not the value of the rebate, it's how much is left after you subtract it. On Tuesday's Today Programme, Phones4U founder John Caudwell said: "We suffer an £8bn net loss to Europe." 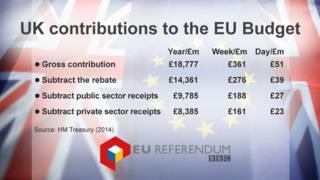 He was referring to the level of the UK's contribution to the EU Budget - there have been loads of figures for this bandied about, so here are some of the amounts you may have heard and where they come from. The figures that most people are using are HM Treasury figures from 2014, because the figures for 2015 are only estimates at the moment. Well, the top line is the gross contribution. Some exit campaigners have described that in recent weeks as being the amount the UK hands over to the EU, but it isn't, because before the contribution is paid the rebate is deducted, to give the amount in the second line. Now, £88m a week is paid back to the UK in the form of payments to support things like agriculture and regional development, leaving a net contribution of £188m a week. Out of that, £26m a week goes directly to private sector organisations in the UK such as universities to fund research, leaving £161m a week going to run EU institutions, pan-European projects and projects in other countries. And that £161m rounds to about the £8bn to which John Caudwell was referring. Mr Caudwell was also asked about whether we would have to continue to contribute to the EU Budget in order to retain access to the single market, as Norway and Switzerland do. "The contribution would be a lot less than we pay," he replied. It's a slightly difficult comparison to make, but fortunately a paper from the House of Commons Library from 2013 did it for us. It says that Norway's contribution to the EU in 2011 was £106 per capita, compared with the UK's net contribution of £128 per capita in the same year. The paper says that Switzerland's contribution as a member of the European Free Trade Areas (Efta) has been about £53 per head in recent years. So both countries contribute less than the UK does - whether Norway contributes "a lot less" is a moot point. This chart shows what's happened to some of the figures for the UK contribution since 1987. Both sides of the debate have been using the figures for 2014, although we do have an estimated figure for 2015, which is a gross payment of £17.8bn, which is £12.9bn if you subtract the rebate and £8.5bn if you deduct public sector receipts. You may find it a bit strange that we still only have estimated figures for the UK's contribution in 2015, given that 2015 has been over for some time. Countries' contributions are based on their economic output. The amount the UK contributed last year was based on forecasts from the Office for Budget Responsibility (OBR). We won't know whether that was the right amount until December this year, and the figures are occasionally revised years later. The OBR has already estimated how much the UK will contribute until 2020-21. This chart shows the OBR's forecasts for gross contribution minus rebate .